Do you know what makes for a really dry writing week? Having a perfectly lovely mid-term break with your children. No, it’s still me, SWB, you haven’t tuned in to the wrong blog but I’m in an upbeat frame of mind, all aglow with feelings of bonhomie and gratitude. This has been one of the most exceptional holidays where every day we’ve spent time with old friends, enjoying real, rich conversations. And we’ve had time to do so because the kids have been that little bit bigger, so have started listening and obeying orders and not throwing fecking wobblers every five minutes. They have actually been a delight. I’m in a mild state of shock myself, but it turns out that it actually does get easier. Do you recall how you’d have been standing in the queue in M&S and the children would have been screaming because you wouldn’t let them buy a magazine with the pack of plastic shite taped to the front, and you’d have been close to tears with fatigue and desperation and some auld doll would have patted your arm and said “Don’t worry love, it gets easier.” I’d have stood, agog, wanting to scream “When? When EXACTLY does it get easier because I AM BEYOND MELTED” and wanting to beg the old dear to please, please take my off-spring for twenty minutes while I just went and stared at the short strappy dresses in Oasis and remembered a more carefree time. Well it turns out that all the auld dolls in Forestside are bang-on-correct because this is the first holiday that we’ve spent at home, with the kids, and I haven’t felt the need to book myself into a retreat to recover. 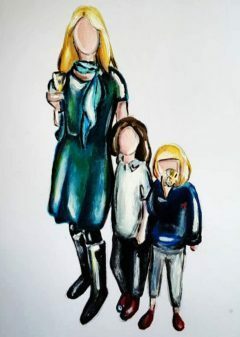 It helps, of course, that I have the most magnificent bunch of friends who have youngsters the same age so there have been playdates where we drink coffee and eat home-cooked fare and the kids have taken themselves off and played and even looked after the mini ones so we can talk in peace. I swear if it hadn’t been for these ladies (and yes mum and dad and the in-laws, you too) I’d have been in the loony bin long since. Another thing we’ve introduced (and trust me, I was sceptical at how successful it would be) is a star chart. 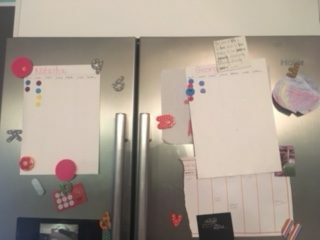 I’ve tried to implement this in the past and the kids just stuck on their own stickers and buggered about and into the bin they went (charts, not children though I was mightily tempted at times). However, suddenly they got the concept and requested that they have one like they have in school. So my Dad dutifully fashioned two out of some recycled card and bought some stickers in some book store in Bloomfields in Bangor and the results have rendered me speechless with glee. The small child has started eating her dinner if it means she gets a star. I have lost hours of sleep tormented that this youngster will be one of those rare and terrible cases of First World children who end up with rickets and beriberi because of the paucity of basic nutrients in their diet. Turns out she can put the broccoli away rightly if there’s a tangible reward in it. They have even volunteered to tidy up after themselves and help unloading the dishwasher, actually arguing about who gets to help more if there’s the promise of a trip to Smiths if they’ve accrued the requisite number of stickers. They aren’t perfect of course: the place is a fecking tip this evening because they were tired and couldn’t be arsed lifting after themselves, but hey, they ate their dinner and were asleep by 7.45 so the debris can lie there, no one’s visiting so I’m not fussed. Funniest thing was earlier this evening when I saw them drawing away quietly. “What’s that you’re up to?” I enquired. “We’re doing another star chat,” replied the older child. “Who’s it for?” I asked, imagining it was one of the dolls, or the cat. “You,” came the response. I can’t really argue with any of this because I’ve been plagued with trapped wind of late and if I were to excuse myself every time I burped I’d be hoarse. It’s one of the joys of being on a career break, being able to expel gas any which way without consequence, but I suppose I had better start training myself if I wish to return to the realms of professionalism at some juncture. Previous Previous post: SWB enjoys stories. At dawn.